Leendert Arend Jan Bos was born on October 21, 1918, in Klaaswaal in Holland. Klaaswaal is located in the area where my Bos ancestors have lived through the ages, but Bos is a common name in The Netherlands, and I have no clue who his parents were. Leendert could be either a distant relative, or no relation at all. His mother's surname was Dirkje and she lived at the Oud Kromstrijensedijk in Klaaswaal. During the war, when he was in his 20s, Leendert was an airplane mechanic in the Royal Netherlands East Indies Army (KNIL). On March 9, 1942 he was captured by the Japanese. He was interned in a Java Pow Camp on August 15, 1942. 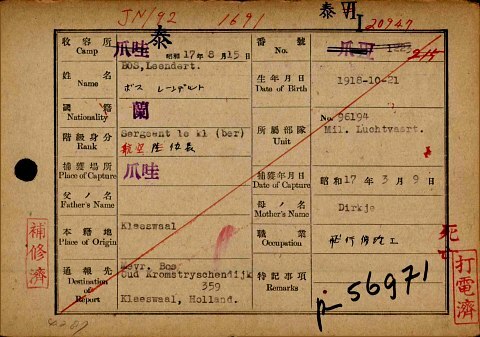 In 1943 Leendert was forced to work on the Burma Railway. 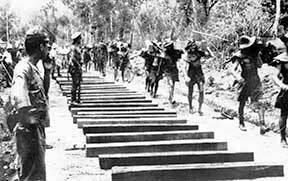 Begun in October 1942 and completed on 16 October 1943, the Burma Railway stretched 415 kilometres between Nong Pladuk in Thailand and Thanbyuzayat in Burma (now Myanmar). It was built by order of Japan during World War II to support its forces in the Burma campaign. The terrain the railway crossed made its construction very difficult. Hellfire Pass in the Tenasserim Hills was a particularly difficult section of the line to build due to it being the largest rock cutting on the railway, coupled with its general remoteness and the lack of proper construction tools during building. The most famous portion of the railway is Bridge 277, 'the bridge over the River Kwai', which was built over a stretch of river. About 180,000 Asian labourers and 60,000 Allied prisoners of war (POWs) worked on the Burma Railway. Of these, around 90,000 Asian labourers and 16,000 Allied POWs died as a direct result of the project. The dead POWs included 6,318 British personnel, 2,815 Australians, 2,490 Dutch, about 356 Americans and a smaller number of Canadians and New Zealanders. One of them was Leendert Arend Jan Bos who died on June 19, 1943, around 15:00 in a hospital in the Thai POW Camp at Tha Makham Village in Kanchanaburi County in Thailand. He had suffered from beri-beri due to a vitamin B1 shortage. Leendert Bos is buried on the Kanchanaburi War Cemetery. See also: GaHetNa.nl, The Building of Hellfire Pass, erelijst.nl, 4en5mei.nl.